In light of frustration with platform policy changes on other social media services like Twitter, LinkedIn today pushed out updated terms of service, a revamped developer-resources Web site and a more explicit approved-developer program. “The intent is clarifying the rules of the road,” said LinkedIn spokeswoman Julie Inouye. LinkedIn’s new offsite sign-in now includes email addresses and specific permissions. The changes are aimed primarily at fixing developer gripes, such as giving them access to the email addresses of users who authenticate with LinkedIn. 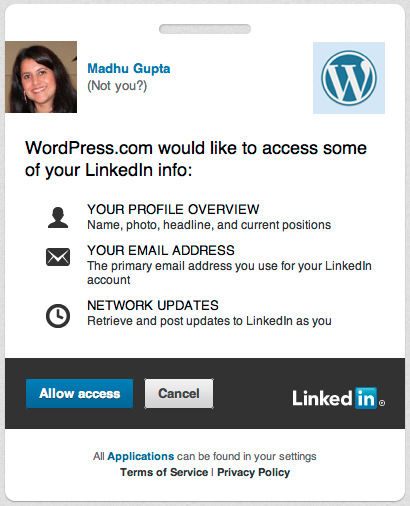 Content shared on LinkedIn will also get more explicit attribution and excerpts through partners like WordPress. This already applies to the million publisher sites with LinkedIn sharing enabled. Like Twitter, Facebook and others, LinkedIn tempts developers with the promise of distribution — in LinkedIn’s case, to 175 million professional members — as well as easier authentication with those people’s professional identities. Plus, approved partners will get higher-level access on a case-by-case basis to things like LinkedIn’s marketing campaigns, job postings and applications. Existing partners include companies like Buddy Media (marketing), Jobvite (hiring) and Hearsay (compliance). LinkedIn said it will soon accept social media management partners, too. In a way, LinkedIn feels developers’ pain about changing platform expectations, as it recently suffered being cut off from deep access to Twitter’s platform — something it had paid for in the past.